I recently entered a plate of these in a baking competition, and they were awarded third place! So rest assured they really do taste especially good 😉 These little treats actually look a lot like Santa Hats with their fluffy trimming, so they make for a perfect dessert to take to your next Christmas function, or share with family and friends on Christmas Day. Speaking of which, I’m so giddily getting into the swing of Christmas. Isn’t it just such a magical time of year? Mum has already made Great-Grandma’s legendary steamed Christmas pudding, that’s sitting safely in the fridge as it matures for Christmas dessert. Alongside it is a huge glass jar filled with dried and fresh fruits soaking in sugar and brandy, and the two week wait for the fruit to plump up with alcohol is almost over, so soon the Christmas cake will be baked and we’ll be eating slices every night with tea as the anticipation for Christmas Day builds! Preheat fan-forced oven to 200°C/390°F. On a lined tray, toast almonds in oven for 5 minutes until golden brown and slightly aromatic. Keep a close eye on them as they burn easily. Once cooled, very finely chop or blitz in food processor. Line a deep roasting dish with baking paper, and pour the sugar in. Bake for 5 minutes, until the edges just start to melt. Remove the sugar from the oven, and reduce the heat to 100°C/210°F. Using a large spatula, very gently fold almond meal through meringue mixture until just combined. Take care to not over mix. Gently spoon meringue into a large piping bag with a 1 cm round nozzle, and pipe meringue kisses onto lined tray. To yield approx 40 kisses, diameter of meringue base should be about 4-5 cm. When piping, keep the nozzle close to the tray and positioned in the same spot, and as you squeeze slightly raise the nozzle to allow the meringue to form a peak. Bake kisses for 45 minutes-1 1/2 hours, depending on your oven, until the meringues appear crisp and lightly golden as pictured. 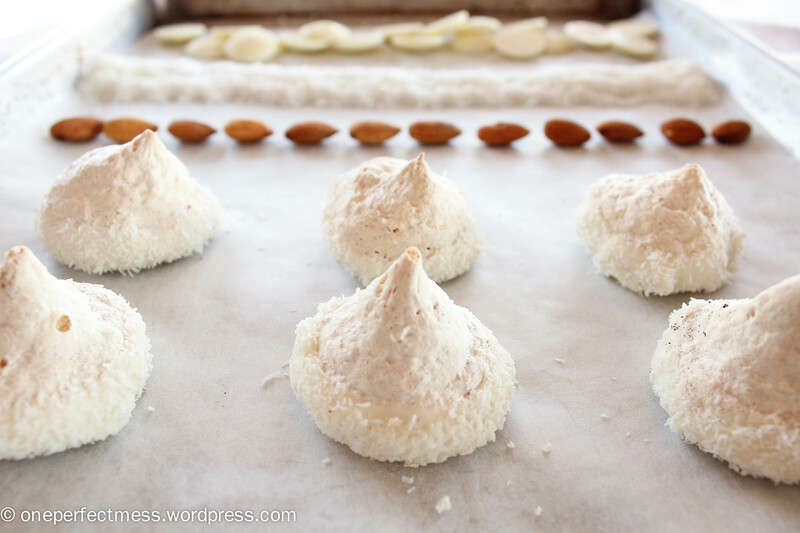 Use the ‘tap test’ to check that the meringues sound hollow by gently tapping one against the tray, and once you’re satisfied, turn off the oven and open the door slightly, allowing the meringues to cool slowly in the oven until completely cooled (or overnight). Break up the white chocolate in a heat proof bowl, and melt over a saucepan of simmering water on medium-low heat. Stir constantly with a small spatula, continually scraping the chocolate from the sides of the bowl to prevent it from burning. Once almost all of the chocolate is melted, remove from heat and continue stirring until completely melted and silky. Allow the chocolate to cool slightly, for about 5 minutes. Dip the base of the cooled meringues into the chocolate, swirling them gently for an even coverage. You can dip them in as deeply as you’d like. Then gently dip each kiss in the coconut, just so that that it clings to the white chocolate. Return dipped meringues to freshly lined baking trays, and allow to cool until the chocolate hardens. Store meringue kisses in an airtight jar or container in a cool, dry place for up to 2 weeks.